Meet Molly and Blaze, like Forrest Gump said: They are like peas and carrots. Everywhere Molly goes, Blaze is sure to follow and vice versa!! These two stripped tabby buds, love spending their days together playing and napping as any one can see. They are about 6 months old and full of energy, little go getters. They are accustom to a large amount of interactive with their foster Mom, kids and dogs. They also need lovey & pet time attention, a cat tower/ tree and interactive toys to be happy. We would be happy to send you pics of fav toys and cubbies they love being in. Then a again a human napping on a couch or bed will do just fine, they are not fussy. 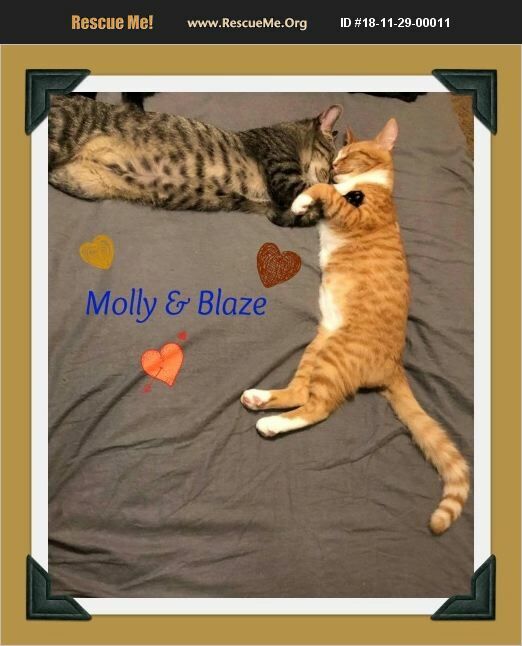 Molly and Blaze are fully vetted, tested for FIV and FeLV, are negative, They have had their rabies and FVRCP feline distemper vaccinations, and have been microchipped. We offer a two week trial to make sure you are hopelessly in love with our peas in a pod! We have many kitties not yet posted, if you are looking for a special kitty, contact us, we have many special kitties!! We also have several awesome lap kitties, our foster only has one lap and needs more laps for kitties. Contact us, fill out an application and we will set up meeting with Molly and Blaze. Thank you for viewing our Snow Camp rescue kitties!! We appreciate you!